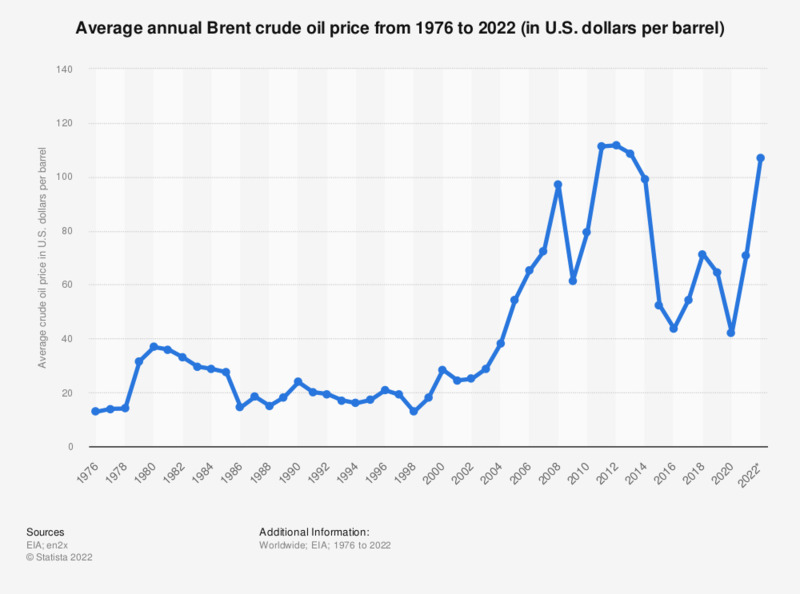 This statistic shows the Brent crude oil price from 1976 to 2019. In 2018, the average price of Brent crude oil was at 71.06 U.S. dollars per barrel. Brent is the world's leading price benchmark for Atlantic basin crude oils. The price of crude oil is closely observed as it influences costs across all stages of the production process and consequently alters the price of consumer goods as well. In 2018, the Brent crude oil prices totaled an average of 71.06 U.S. dollars per barrel, down significantly from the 2014 average price of 99 U.S. dollars per barrel. To put the 2018 figure in context, however, it was a considerable increase from the 2001 average, at 24.45 U.S. dollars per barrel. Brent Crude is considered a classification of sweet light crude oil and acts as a benchmark price for oil around the world. It is considered a sweet light crude oil due to its low sulfur content and a low density. This oil originates in the North Sea and is comprised of several different oil blends including Brent Blend and Ekofisk crude. Often, this crude oil is refined in Northwest Europe. West Texas Intermediate (WTI) oil prices totaled 25.9 U.S. dollars per barrel in 2001 and rose to 93.25 U.S. dollars per barrel in 2014, before decreasing significantly to 43.15 U.S. dollars per barrel in 2016. The WTI is another type of sweet light oil and is often referenced alongside of UK Brent. Urals oil is used as a benchmark price for Russian export oil mixtures. It is a combination of heavy and light oils. The price of Urals crude oil was expected to rise from 78.2 U.S. dollars per barrel in 2010 to 116 U.S. dollars per barrel by 2017 (based on a 2012 projection), however this benchmark has followed the general trends of other benchmarks, and had a daily oil price of 53.42 U.S. dollars per barrel in January 2017. Oil futures class Urals is listed on the Russian Trading System stock exchange.